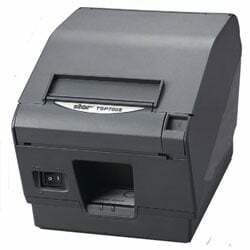 Star TSP743 - Thermal, two-color printing, 7 ips, Ethernet interface. Includes auto-cutter. Order cables & power supply separately. See accessories. Color: gray. The TSP743 Series includes the TSP743 model. The super fast TSP743 2-color thermal printer is packaged in a small footprint and is ideal for POS, credit card, restaurant, barcode, hospitality, and kiosk applications. Businesses can really benefit from the ultra high print speed. The TSP743 enables you to print receipts with logos and barcodes plus add coupons or rebate certificates while decreasing customer wait time. The TSP743 can store multiple logos or coupons in the printer, allowing you to print a company logo or coupon with every receipt, even when using a serial printer. The Star TSP743E-24GRY is also known as Star Micronics	TSP743E-24GRY	or TSP743E24GRY	.